In 2366 a single Borg Cube invaded Federation space in an event that would later be called the first Borg incursion. A hastily assembled fleet of forty ships engaged the Cube in the Wolf 359 and the ensuing battle saw the fleet defeated by the single Borg vessel. This loss was a blow to the fleet and with more tactically oriented ships such as the Defiant, Saber, and Sovereign classes still under development a way was needed to bring more fire power to the fleet and in a timely manner. Two months after the Battle of Wolf 359 several ideas were put before the Advanced Starship Design Bureau and after another month of deliberation a decision was made. The plan was simple take one of the fleets newest ship classes and turn it into what was essentially a battle ship even though it would be classified as a Heavy Cruiser under the system used by Starfleet. The chosen class was the Galaxy. To that end the total number of Phasers was increased from a total of twelve to nineteen, this included two Pulse Phaser Cannons mounted to each side of the bridge module and a single Heavy Phaser Cannon mounted to the underside of the primary hull. The number of torpedo launchers were increased from two to six and the total torpedo load out was increased to match the increased number of torpedo launchers, the new launchers were housed in a weapons pod that was mounted just behind the bridge module and above the main shuttle bay. The number of Marines that were carried onboard was increased to 680 also. A third nacelle was added to the ship to reinforce the field strength of the warp field. The plan did have its detractors, while some complained that it was a waste of resources that could be better used to further the Defiant Class Development Project. Others opposed the Galaxy Refit claiming the additions to the design marred the graceful lines of the Galaxy Class. Still in face of this opposition the Galaxy Refit Project when forward. The USS Pegasus a Galaxy Class ship that was under construction at the Utopia Planitia Fleet Yards was chosen as the first of the Galaxy Refits and it's construction was completed to meet the new specifications. Construction was completed in 2370 and the ship left Utopia Planitia on a shakedown cruise. Most of the ship's systems functioned within the expected perimeters but the large phaser cannon failed its test when damage to the prefire chamber caused an automated system shutdown during testing at half the cannons rated output due to stress fractures in the chambers outer shell. The Pegasus returned to Utopia Planitia and the prefire chamber was removed for study. While there the mounts for the Pulse Phaser Cannons where reinforced so as to reduce movement of the cannons during firing. In the later half of 2370 the Pegasus was sent out on a second shakedown cruise to complete testing on all systems except the heavy cannon. The early part of 2371 saw the Pegasus return to Utopia Planitia and a completely redesigned prefire chamber added to heavy cannon. During this time two fusion generators were added to the Cannon's design so that the cannon could fire at full strength without having to reroute power from other systems. After completing a full range of live fire testing at full strength in the outer reaches of the Sol System the Pegasus was returned to Utopia Planitia a final time in the later part of 2372 for minor system adjustments and so the final signage including the ships name and registry number could be added to the outer hull. 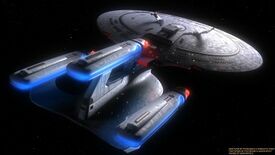 In 2373 after a brief commissioning ceremony the USS Pegasus entered service. Since that time the Pegasus and other ships of the Galaxy Refit design have proven to be powerful additions to the fleet with war with the Klingons and the Dominion giving them ample opportunity to prove their tactical abilities. In the years since the end of the Dominion war these ships have proven just as capable of diplomatic and exploratory missions. In total of six ships have been built to the refit specifications with plans to add another six to the fleet if so required. 1 linear array dorsally mounted to the saucer section inboard of the starboard impulse engine. This page was last modified on 3 April 2019, at 00:48.